The “mysterious dinner snake” has some odd habits, including a propensity to burrow. 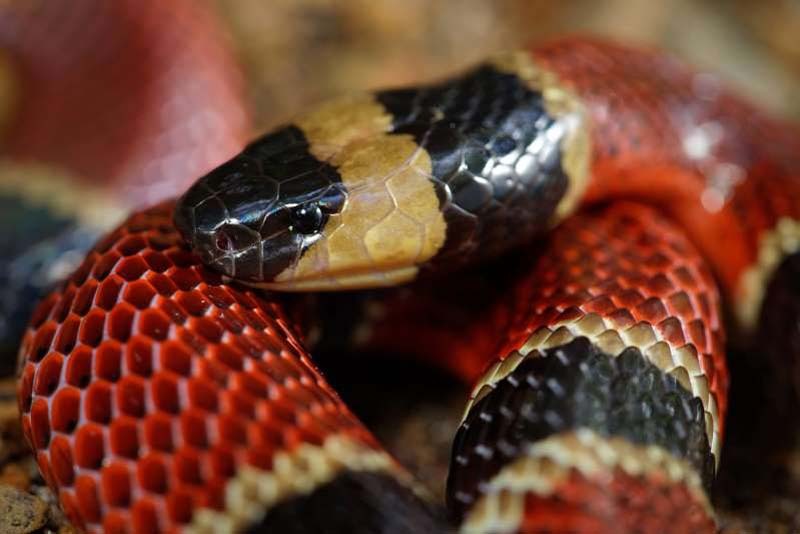 The Central American coral snake (Micrurus nigrocinctus) commonly eats other smaller serpents, including a newfound species that hasn't yet been found in the wild. Scientists have discovered a species of snake unlike any seen before, but this special serpent wasn't found sliding through its forested habitat in tropical Mexico. The newfound animal made its scientific debut in a more unconventional place: inside another snake’s belly. Newly-described in a recent paper in the Journal of Herpetology, the creature has been appropriately dubbed Cenaspis aenigma, which translates to “mysterious dinner snake.” The name derives from the Latin cena (dinner), aspis (a snake variety), and enigma. © Photograph by Carl J. Franklin A mere glimpse at some of the 200,000 plus amphibians and reptiles housed in Amphibian and Reptile Diversity Research Center at the University of Texas at Arlington. This species has unique features that separate it from its relatives, including the shape of the its skull, the covering of its hemipenis—its reproductive structure—and the scales under its tail. Based on certain features of its skeleton and teeth, scientists think Cenaspis is a burrowing snake that likely feeds on insects and spiders. 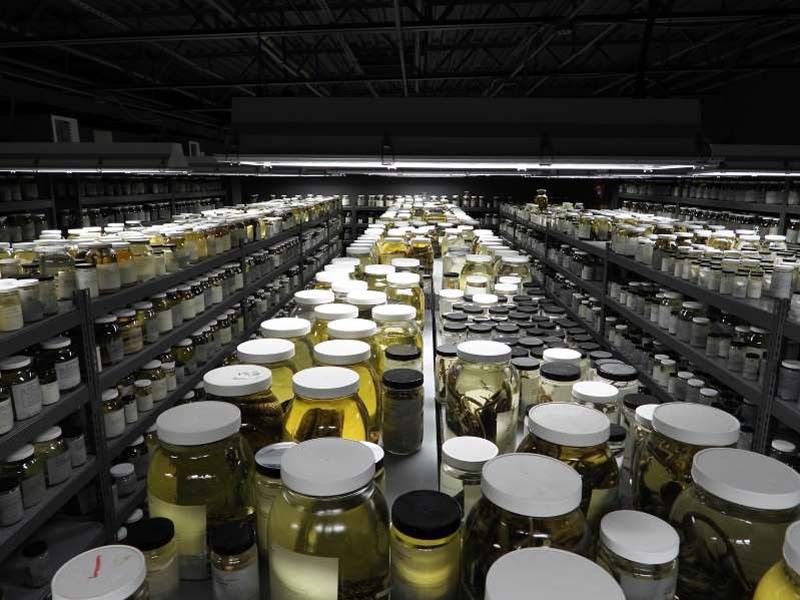 Incredibly, however, no live specimens of the creature have been found—so it’s hard to know precisely what it eats or how it lives, says Jonathan Campbell, a herpetologist at the University of Texas at Arlington who led the research team. The snake, you see, has evaded detection for 42 years. In 1976, in the southern Mexican state of Chiapas, palm-harvesters working deep in one of the region’s forests found a Central American coral snake—a vibrantly-colored species with neurotoxic venom. When researchers obtained it, they found that its last meal was another smaller serpent. This ten inch-long, male snake was something special, as it didn’t match any known species, so the specimen was preserved in a museum collection. The research team returned to the area at least a dozen more times over several decades, but never found a living representative of the odd snake species. Campbell doesn’t think that the snake’s disappearing act is from a post-70s extinction. Rather, he thinks Cenaspis is still out in Chiapas somewhere, but a burrowing lifestyle coupled with other secretive habits may make it difficult to find. The underside of the creature is adorned with three series of triangular blotches that make irregular stripes; very few snakes in the New World have similar striping. It also has fourteen short, stout teeth in its upper jaw; most members of its family have more or less than that. But Cenaspsis’s hemipenes are its most bizarre attribute. Most of its relatives have hemipenes festooned with spines along the organ’s body, some decorated with cup-like structures called calyces at the end. The new species’ appendage is spineless, and absolutely covered in calyces, making it look like some kind of otherworldly honeycomb. The snake is unique enough that it qualifies not only as a new species, but a new genus (which is a group of closely-related species—for example, the genus Canis includes Canis lupus, the gray wolf, but also other animals like coyotes and jackals). Sara Ruane—a herpetologist and evolutionary biologist at Rutgers University-Newark not involved in this study—is impressed by the finding. “This is an excellent contribution to herpetology and reminds us all that you never know what new information you may get when doing field collections and taking a closer look at what is already in museums—and why such collections are important,” says Ruane. Kevin de Queiroz—zoologist and curator of the collection of Amphibians and Reptiles at the Smithsonian’s National Museum of Natural History—agrees. While little is known about the biology of the “dinner snake,” the species’ strange, Russian-nesting-doll discovery provides an important lesson about the world’s biodiversity, much of which remains unseen and unrecognized. “[The discovery] tells us that there are likely still Neotropical snake species remaining to be discovered that are relatively isolated evolutionarily,” says de Queiroz. For Campbell, the uniqueness of Cenaspis suggests its habitat is likewise special, and irreplaceable—and worth being considered as a park or protected area.